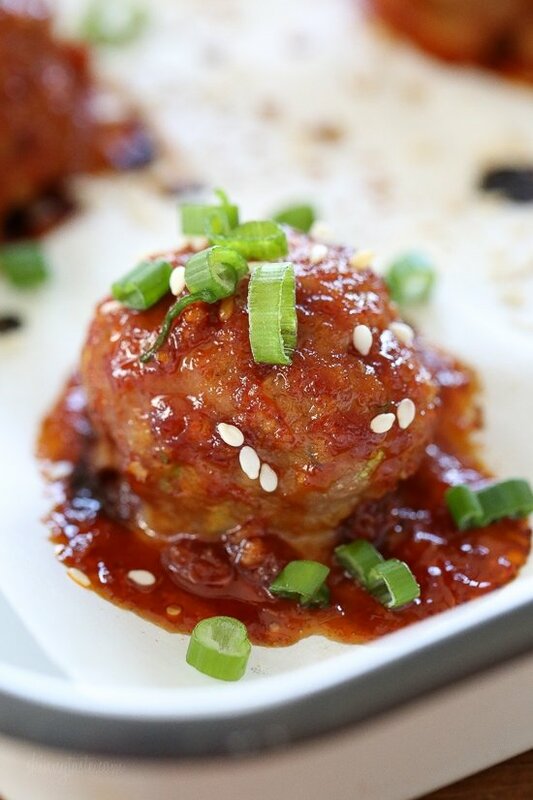 These Korean-inspired Asian Turkey Meatballs are seasoned with ginger and spices and finished with a sweet and spicy, gochujang glaze. Great as an appetizer or serve them with brown rice to make them a meal. Also great for meal prep! 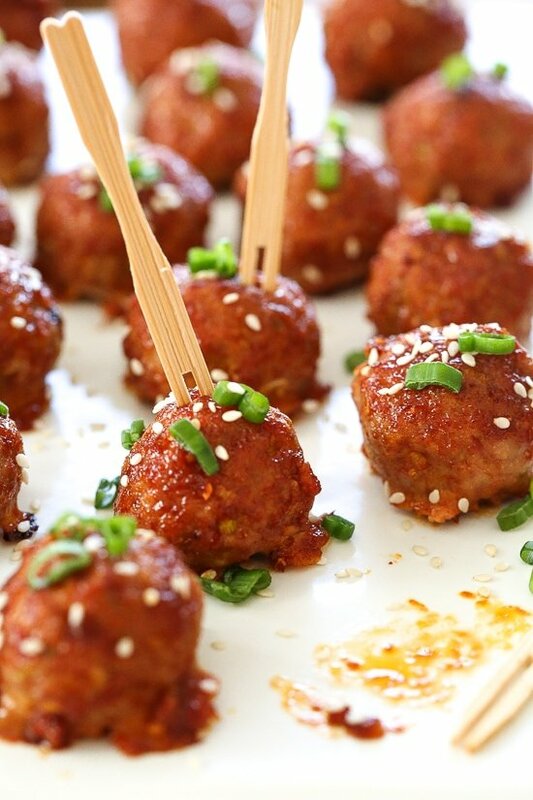 More meatball recipes you might enjoy are Sweet and Spicy Turkey Meatballs with Bacon, Buffalo Chicken Meatballs, Honey Lime Meatballs, and even Mini Burger Bites. I’m obsessed with gochujang, a thick, spicy red chili paste and one of the backbone ingredients of Korean cooking. I love the kick and depth of flavor that it adds to everything you stir it into — a little goes a long way. This dish is excellent as an appetizer served with toothpicks, or make it a main dish for dinner over rice for 4 servings by increasing the the meatballs, about 5 per person. This also makes a great meal prep dish! To meal prep for 4 days, you will need 3 cups cooked brown rice. You can cook the rice or buy frozen brown rice for convenience (I love Trader Joes!). Divide 3/4 cup brown rice per serving with 5 meatballs and transfer to meal prep containers. I love these glass meal prep jars (affiliate link). Refrigerate for the week. To reheat, microwave 2 to 3 minutes, until hot. You can also freeze them in a freezer safe meal prep container, then transfer to the refrigerator the day before eating. You can see more meal prep recipes here. 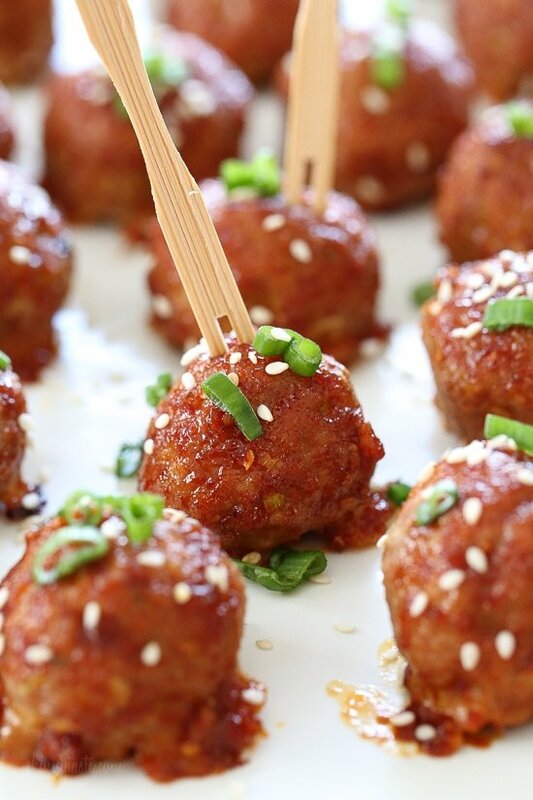 These Asian inspired turkey meatballs are seasoned with ginger and spices and finished with a sweet and spicy, gochujang glaze. Great as an appetizer or serve them with brown rice to make them a meal. Also great for meal prep! Preheat oven to 400 degrees. Cover 1 large sheet pan with foil and lightly spray with oil. For meatballs: Combine all ingredients from turkey to scallions (whites only) in a large bowl. Mix thoroughly. Using your hands, form into 21 round meatballs, about 1 oz each. Place the meatballs, evenly spaced, on the prepared sheet pan. Baked for 20 minutes in the center of the oven. Preheat the broiler on high and position the rack about 5 to 6 inches from the heat, second rack from the top. 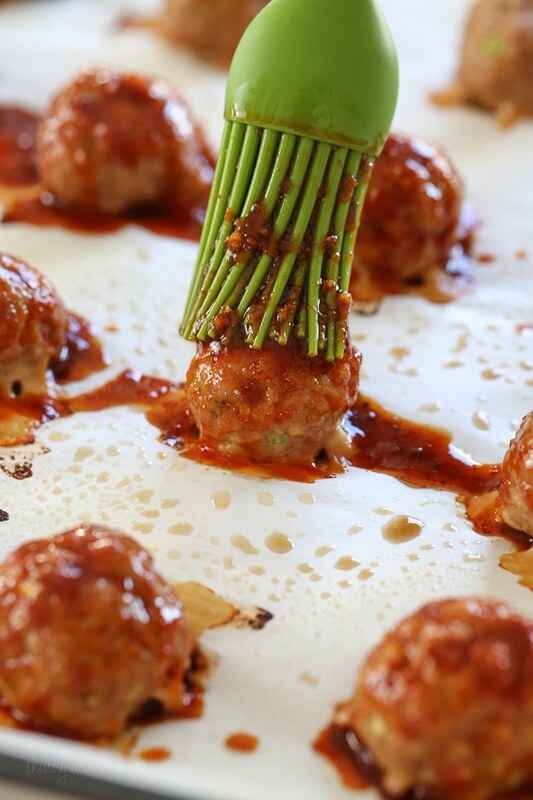 Brush the meatballs with glaze and broil about 2 to 3 minutes. Transfer to a platter and top with sesame seeds and scallions. Serve with toothpicks as an appetizer or with rice if desired as a main dish.